1.In large saucepot, heat oil over medium heat. Add bell peppers and onion, and cook 5 minutes or until vegetables begin to soften, stirring frequently. Stir in garlic, chili powder, cumin and oregano, and cook 1 minute. 2.Increase heat to medium-high. Add beef and cook 8 to 10 minutes or until browned, breaking up meat with side of wooden spoon. Stir in tomato paste and cook 1 minute. Stir in chiles, salsa and water, and heat to simmering. Reduce heat to medium-low. Cover and cook 10 minutes, stirring occasionally. Stir in beans and salt. If chili seems thick, add up to 1/2 cup additional water. Cook 5 minutes. Serve chili topped with green onions, tomatoes and/or cilantro, if desired. 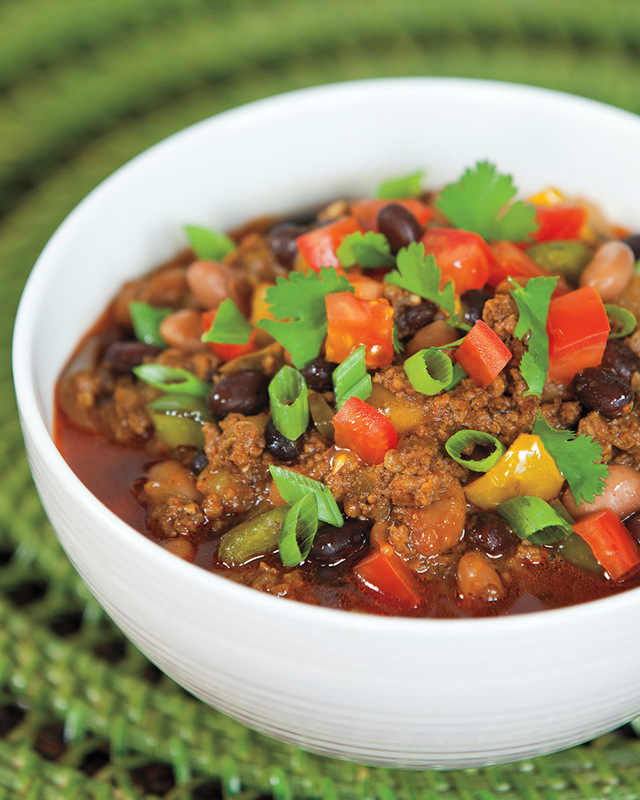 For a vegetarian-friendly version, replace the ground beef with more black beans or pinto beans. Or, add in additional things such as garbanzo beans, quinoa or corn! This also helps boost the protein and fiber content.